It’s easy to fall into a rut. We have a tendency to take our sight for granted; even though I insist on taking my camera everywhere along with me, the pesky contraption often goes unused. I have to press myself to look more closely at the world around me, to try and identify overlooked little details, hidden beauty, peculiarities with unspoken meaning. The trick is remaining inexhaustibly curious, to always look about oneself rather than just ahead – or at one’s feet. Personally, I make an effort to remind myself how extraordinary even the most banal things truly are. In town, everything around us is completely intentional. The paint on the sidewalk was put there by a man. The bricks that tower above us were molded and fired, trucked out, and stacked together, one at a time. The evidence of those who came before are all around us. The people are everywhere under our feet. I stepped outside my cramped little apartment, ready to hit the road; I had to go to Tucson to photograph the University of Arizona College Rodeo. I decided to get an early start so that I might have the time to step outside the car and take some pictures – you know, if the mood struck me. 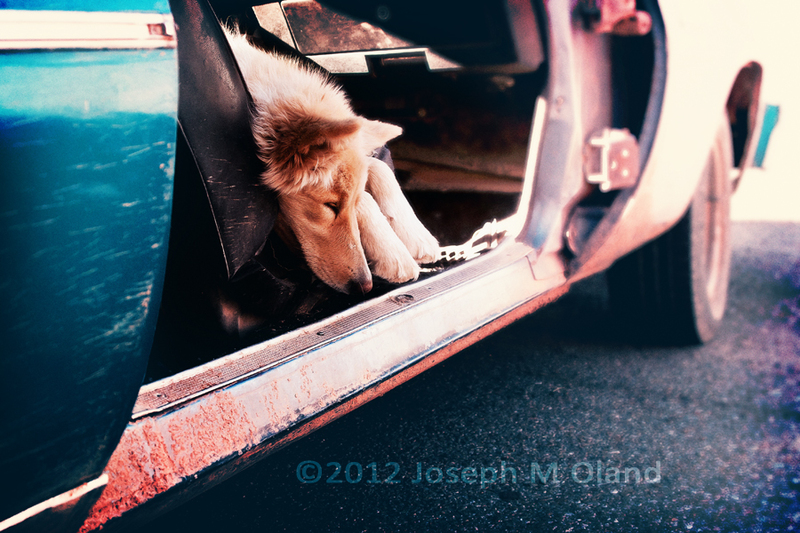 Before I could unlock my car I spotted this lounging beast – a wolf hybrid, basking in the sunlight, careless in the passenger seat of an old beat-up car. It’s easy to fall in a rut, but amazing things are all around us.